Afghan means only Pashtun?? Hold on! Alot of pseudo-historians amongst Afghanistan's Pashtuns as well as their Indian-Brahmin partners in the propaganda war against Pakistan like to portray Afghanistan as a mono ethnic state consisted entirely of Pakhtuns, that "Afghan" is simply another word for Pashtun. Anyone with brains knows this to be entirely wrong. Afghanistan is a multi-cultural, multi-ethnic country with Pashtuns being only 42% of the population. "Afghans" are simply a people who share a common nationality, much like "Americans", "Canadians" or any other. The people who inhabit the present-day landmass known as "Afghanistan" are called Afghans. 42% of these people are Pakhtuns, 27% Tajik, 9% Hazara, 9% Uzbek, 4% Aimak, 3% Turkmen, 2% Baloch and 4% other. This is clear proof Afghan and Pashtun are not the same. Pashtuns are just a percentage of the Afghan population. If Pashtun is an equivalent for Afghan, then Fars/Persian is an equivalent for Iranian, Punjabi is an equivalent for Pakistani and so on. The agenda behind the Afghan=Pashtun lie is to take away the NWFP from Pakistan and give it to Afghanistan. By this contrast the fascist, intolerant Karzai regime and their predecessors the Afghan royal family should have released the Uzbek populated lands of Afghanistan to Uzbekistan. The Turkmen populated lands to Turkmenistan, the Tajik occupied lands to Tajikistan. Also by this contrast the Indian Brahmins should allow the people of the Bengal state of India to re-unite with Bangladesh as well as handover their Punjab state to Pakistan as Pakistan's majority population is of Punjabi speaking background. Afghanistan has tried to steal Pakistan's western provinces ever since the departure of the British while at the same time maintaining it's illegal existence and occupation on Uzbek, Tajik, Turkmen and Hazaara lands. Let us not forget the Afghan state was illegally carved out of lands inhabited by Uzbeks, Tajiks, Hazaaras, Turkmens whom ever since have sought to unite with their ethnic brotherin living across artificially constructed borders in Uzbekistan, Tajikistan and Turkmenistan respectively. Because the fascist Pashtun regimes of Afghanistan have refused to accept the Durand line and have waged several wars against Pakistan in an attempt to steal Balochistan and the NWFP, Pakistan in turn got involved in Afghan politics and aided the Uzbeks, Tajiks, Hazaraas and the Turkmens in their mission to break away from the illigal state of Afghanistan. Caucasianoids (mainly Pakhtuns, Tajiks, Baloch) and Mongoloids (mainly Uzbeks, Hazaaras and Turkmens). Clearly Mongoloids and Caucasianoids are of two completely different origins. Along linguistic lines "Afghanistan" can once again be divided into two main linguistic groups. One being Indo-Iranic the other being Turkic. The Uzbeks and Turkmens fall into the Turkic grouping. The Tajiks, Pashtuns and Baloch fall into the Indo-Iranic grouping (though Tajiks have heavy Turkic/Mongoloid racial infleuence). The Hazaaras, though Indo-Iranic speaking are actually of Turko-Mongoloid origins like the Uzbeks and the Turkmens so they too fall under the Turkic grouping. -They are caucasianoid, like the rest of Pakistan clearly showing a common origin with most of Pakistan than with other populations in Afghanistan. -The majority of them are from the Pakistani side of the border. -They are Indo-Iranic speaking, like the rest of Pakistan. 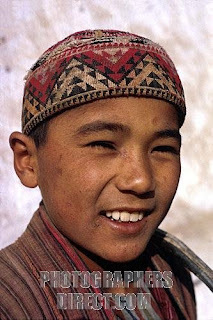 -The Pashtuns being Caucasians do NOT share a common origin with the Mongoloid/Turanoid Uzbeks, Hazaras or Turkmens. So racially and linguistically the facts show the Pashtuns are more Pakistani than "Afghan" though the Pashtuns of Afghanistan will never accept this. Pakistani Pashtuns on the other hand mostly remain indifferent to the issue of the Durand line. They are also scattered throughout Pakistan in search of a better life and can be found in Pakistan's industrialized areas such as Karachi where they have more oppertunities. This would not be possible in Afghanistan which is completely war torn, thanks to the ignorence of the Pashtuns in Afghanistan. The ruling Pashtun elites from Afghanistan need to come out of their ignorance and face reality instead of pretending they are the only ethnic group inhabiting Afghanistan. They cannot hold on to the lands they captured to carve out Afghanistan in 1747, at least not without fueling another long, bloody civil war costing many of their own lives. The Turko-Mongoloid populations of Afghanistan will not leave as the Pashtuns want them to. They lived in the area for centuries much before the Pashtuns occupied them to carve out "Afghanistan." They will not suddenly move out after all these centuries. 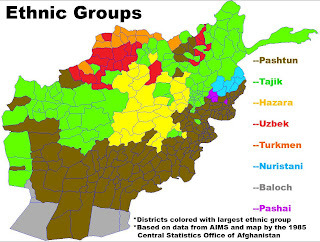 And despite Tajiks being ethnicly closer to the Pashtuns, the Pashtuns have also refused to accept them as Afghan. Likewise the Tajiks have in turn have resisted Pakhtun imperialism and hegemony. Clearly, the non-Pakhtun majority of Afghanistan are there to stay and are as "Afghan" as the Pakhtuns. Afghanistan's Pashtuns will have to clearly accept what is not theirs. Baluchistan and the NWFP are going to remain with Pakistan. Pakistan has a legitimate claim to them along racial, linguistic and historic lines. After all many pre-historic civilization in Pakistan (particularly the Indus Valley Civilization) contained both regions. Afghanistan can only prosper if the Pashtuns accept that they are not the only ethnic group living there and stop claiming lands that do not belong to the Afghan state-unless they are willing to loose territory in return. Instead they should share power with the non-Pashtun majority to defuse tensions and promote unity. It also may perhaps discourage Uzbeks, Turkmens, Tajiks from joining the neighboring Stans and Pakistan is likely to stop backing their separatist ambitions in return provided the ruling Pashtun elites abandon their falsified claims over Pakistani lands. -Pakistani nationalists in turn would continue to seek an alliance with Turkic and Tajik nationalists and try to break up Afghanistan once and for all. This has been seen in the past few decades long before the Afghan civil war erupted in the late 1980s. -Pan-Turkic movements in Turkey and thought the former Soviet Union seek to break away Turkic inhabited areas in Afghanistan and emerge them into "South Turkestan"
They are most likely to gain Pakistani state backing in the future should Afghanistan's Pashtun elites continue to align themselves with Brahmin Hindutvas and continue to lay false claim on what is rightfully Pakistani territory. Conclusively another bloody, larger and regional conflict may be underway in the coming future, involving allot more than just Afghan Pashtuns elites and the Pakistani government should the Pashtun elites of Afghanistan seek the wrong path and get other parties or entities involved in another pointless and preventable conflict. War is not in the interests of any state or ethnic group and must be the last measure taken in a situation of conflicting ambitions between states and/or ethnic groups. Do the the "Afghans" pictured above look like they could be of the "same race?"